The King of Jazz, a two-color musical film starring bandleader Paul Whiteman originally released in 1930 by Universal Pictures, has been restored and had its world premiere at the Museum of Modern Art in New York City on May 13. The movie is an entertainment spectacular with a minimal plot in which the Whiteman orchestra performs its most famous symphonic-jazz composition, George Gershwin’s Rhapsody in Blue. Bing Crosby makes his screen debut singing several songs (with the Rhythm Boys and as solos), and the Russell Markert Dancers (who later became the famous Rockettes at Radio City Music Hall) do their choreographed dance routines. The first Technicolor animation is presented as one of the comedy routines in which “The Stars and Stripes Forever” is played on a bicycle pump. Whiteman appears as himself and was good-naturedly kidded about his weight and dancing skills. The film cost two million dollars to produce ($21 million in today’s dollars), but was never a box office success and did not show a profit until 1933. Between the mid-1930s and early 1960s, no one was able to see The King of Jazz. It was effectively lost, and it was not until a collector in England uncovered a nitrate print and copied it to 16mm did the film become accessible again. Both the nitrate print (now stored at the Library of Congress) and Universal’s camera negative were used for the restoration. Some addition footage, not seen by audiences since 1930, has been added. 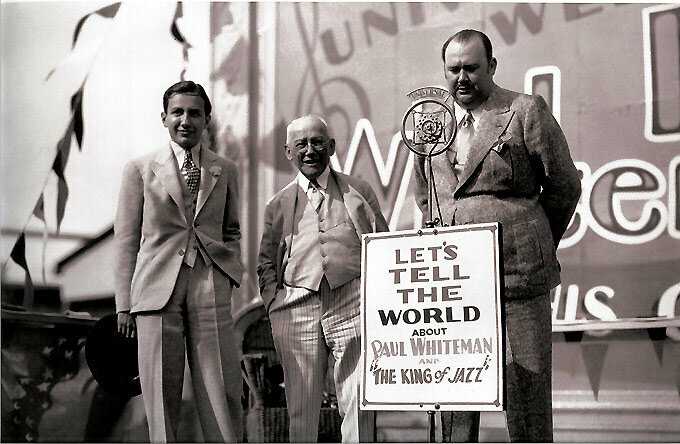 A book titled King of Jazz; Paul Whiteman’s Technicolor Revue is being written by James Layton and David Pierce, co-authors of Dawn of Technicolor, 1915-1935. To be published by Media History Press, it will cover the history of the film, its participants, influences, production, release, and restoration along with hundreds of photographs and illustrations. Previous Paul Whiteman: A Biographical Sketch.